GORINCHEM, the Netherlands — The 18 Eritrean refugees arrived in this picturesque, blue-collar Dutch city 20 miles east of Rotterdam earlier this month looking for safety, security and, finally, after 18 months of fear and uncertainty in two refugee camps on two continents, a home. Refugees are not an uncommon sight in the Netherlands. More than 500 are granted legal status every year in the country’s municipalities, towns and cities, often in groups of two or three, though a huge number of economic migrants arrive, many illegally. This group of 18 was different, though, and not only because they comprised the majority of the Eritrean men’s national soccer team, and the team’s doctor. They were unique because they arrived here in the same manner they had fled their homeland: together, as a squad. And their arrival caused a political stir felt far outside this sleepy city of canals and bridges and its population of 35,000. “It was a romantic story where a group of young people are defecting from their country for all the best reasons,” said Gorinchem’s mayor, Anton Barske. In December 2012, the entire Eritrea national team disappeared after playing an international tournament in Uganda. The players resurfaced a few hours later at the compound of the United Nations High Commissioner for Refugees, the United Nations’ refugee agency, in Kampala, where they claimed political asylum. After six months in a refugee compound, the majority of the group moved to an emergency transit camp, a clearinghouse for high-risk refugees, in the western Romanian city of Timisoara. The team was deemed to be in danger given its high profile; they were the latest of more than 50 soccer players who had fled the country since a national squad failed to return from a tournament in Kenya in 2009. From Romania, the team traveled to the Netherlands and, finally, to Gorinchem. Barske, who belongs to the progressive Green Left party, welcomed them with open arms. Not everybody has been as happy to see the team. Shortly after the team’s arrival this month, the country’s populist, far-right political party — the Party of Freedom (PVV) — lodged a question with the Dutch parliament asking why the Eritrea players had been allowed to enter the country and been given housing and cash ahead of Dutch citizens. Elections to the parliament of the European Union were approaching, and parties like the PVV and the UK Independence Party were expected to make huge gains across the continent largely on an anti-immigration ticket. The team’s arrival in the Netherlands, he said, was irresponsible and sent the wrong message to refugees from Africa. “It is no wonder that thousands of Eritreans now seem to think that they are welcome in the Netherlands and that welfare benefits are waiting here for them,” he said. After gaining independence from Ethiopia in 1993 following a bloody civil war, Eritrea rapidly disintegrated into one of the world’s worst abusers of human rights, according to reports by Human Rights Watch and U.N. investigators. There was no democracy, and little or no freedom of speech or movement. Torture remained routine, and young people were kept in a continual state of army conscription. Human Rights Watch estimated in 2011 that 50,000 Eritreans lived in refugee camps in Ethiopia and that thousands try to flee from Eritrea every week despite troops at the border having orders to shoot to kill. Yet soccer offered a lucky few the rare chance for foreign travel, a right denied to all but the highest-ranked politicians and officials. Foreign travel meant the possibility of escape. When players from the national team first disappeared after the tournament in Kenya in 2009, they were also given refugee, this time in a camp in Nairobi, before eventually being resettled in Australia. “The government decided that all players should go on national service, too,” Ermias Haile, a midfielder for that team, recalled in an interview in his home in 2011. He made it to Adelaide, where he shared a house with four former teammates, working in a switchboard factory by day and playing semipro soccer at night. “I learned that when life gives you a hundred reasons to cry, life gives you a hundred reasons to laugh,” he said of his escape and subsequent resettlement. But it is not every day that a crop of unattached international players arrives in a country, and several of those who settled in Australia went on to play in the A-League, the country’s top league. Likewise, in Gorinchem, the city’s five soccer clubs have been covetously watching the new arrivals. On the outskirts of the town, next to the highway and a wooden windmill, sits the small but well-kept stadium of SVW. The club plays in the fifth tier of Dutch soccer, and this season has not gone well: the club could be relegated if late-season results go badly. Their crowds, some wearing the team’s red-and-white striped jerseys, can be counted in the hundreds rather than thousands. On the opposite side of the road sits Unitas soccer club. It also wears red and white stripes, but they are horizontal, unlike SVW’s vertical stripes. “My first thought about their arrival was feeling pity for them that they left their country and left families behind,” said Bert Walhain, Unitas’s chairman. With a 116-year history, Unitas is one of oldest clubs in the Netherlands. It has been more proactive than SVW, Walhain said, sending scouts to watch the Eritreans practice in a local park. “That decision has to be made by the boys,” Walhain said when asked why the Eritreans should choose Unitas over SVW. The 18 Eritreans have declined all interview requests since their arrival. According to the Dutch Council for Refugees, an independent organization, the players still fear for their lives and the lives of the family members they left behind in Eritrea. Berketeab Tesfai knows well the fear for those left behind. Tesfai, a 47-year-old high school math teacher and human rights activist, fled Eritrea two decades ago. He is now helping the players to learn Dutch and settle into their new lives. Eventually the Eritreans will be incorporated into the community, play in the city’s teams and work in the city’s factories, most in Gorinchem agree. Its manufacturing sector is thriving. One of the city’s biggest businesses is bridge building. They are manufactured here, shipped to Rotterdam and then sent to the rest of the world. “We welcome people who are on the run from all over the world because there are conflicts creating huge number of refugees, and you can’t shut your eyes to that,” said Barske, the mayor, even if he was unsure just how much benefit the local soccer teams, or even, further afield, the Dutch national team will receive. 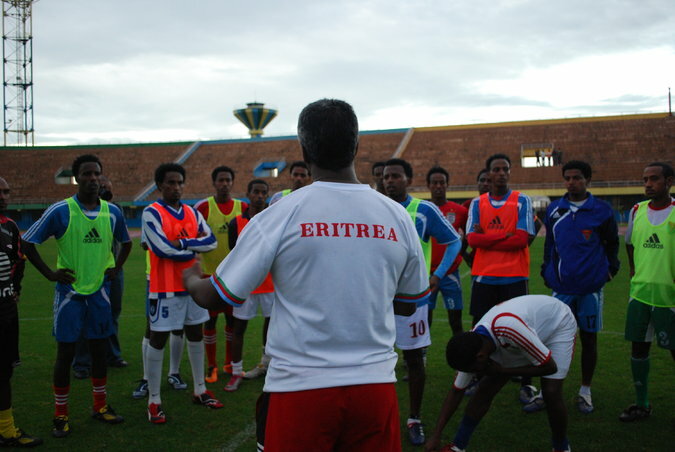 Barske noted that Eritrea was 200th, out of 207 national teams, in the FIFA world rankings.